One of the most recognised names in the travel industry, Brittany Ferries was founded in 1972 by Breton Alexis Gourvennec and a group of fellow farmers with the aim of exporting their crops of cauliflowers and artichokes to the UK. When Gourvennec failed to interest the existing shipping providers in operating a route between Brittany and Plymouth following Britain's entry into the common market, they launched their own freighter named Kerisnel in 1973. The company grew throughout the 1970s with its first ferry-inclusive holidays, and launched a new Plymouth-Santander route in 1978 offering the fastest sea route to Northern Spain. Throughout the 1980s and 1990s Brittany Ferries continued to grow, constantly acquiring new vessels and routes to become one of the most popular leisure ferry service providers between England, France and Spain. Today, Brittany Ferries is the leading maritime carrier to the western and central Channel – and the original farming groups remain shareholders in the company to this day. Brittany Ferries operates nine vessels along their routes, each boasting an excellent standard of both comfort and safety. Seven of these are dedicated cruise ferries, providing memorable and exciting holidays for families and couples looking to experience cruising. On board you'll find a choice of restaurants and bars offering excellent cuisine and a chance to relax and unwind, not to mention fantastic duty free shopping, first class entertainment and comfortable accommodation. They also operate a high speed ferry service, offering quick connections between England and France on board the Normandie Express. Capable of carrying foot passengers, cars and small vans at a speed of 42 knots, the Normandie Express operates on the Portsmouth to Caen and Portsmouth to Cherbourg routes. On board you'll find plenty of room to walk around along with comfortable reclining seats, an exclusive boutique, bars and a cafe serving up delicious cuisine. Want to get away from it all with Brittany Ferries? Brittany Ferries discount codes can make you big savings when you book. Whether you're planning a family holiday to the beaches of Spain or a cultural break with friends exploring France, Brittany Ferries offers will help you save your pennies to spend while you're away. Browse our website until you find a Brittany Ferries discount code that's right for you, then navigate to their website to make your booking. Enter your desired journey details and click 'Go'. Fill in your passenger information and click 'Continue'. Select a journey and click 'Continue'. Choose a seat or cabin accommodation and click 'Continue'. Enter your Brittany Ferries offers where applicable. Want to find out more about the destinations served by Brittany Ferries and their fantastic vessels? Why not check out the company's dedicated YouTube channel? You'll find lots of exclusive content including holiday features, travel inspiration, video tours of their ferries and more. You can also use this channel to find out more about saving money with Brittany Ferries discount codes. Enjoyed shopping for great ferry rates at Brittany Ferries? Why not shop for the best deals on accommodation in France and Spain with lastminute.com or booking.com? Or, if these don't float your boat, you'll find plenty more stores to browse in our Travel section. Thanks to DFDS saving is now dead easy! If you already know the advantages of vouchers, why don't you discover other online stores from category Travel as well? Wightlink also offer very nice discounts. Navigate to their website to make your booking. Enter your Brittany Ferries vouchers where applicable. Fill in the lead passenger information and address and click 'Continue'. Need to contact the team at Brittany Ferries? Whether you have a question about your booking, want to know more about your journey or simply want to find out how you could save money with Brittany Ferries voucher codes, you can contact the Customer Services department by telephoning 0871 244 0744. Want to find out more about Brittany Ferries, where they go and what you will discover? Why not follow them across your favourite social media platforms? You'll find competitions, travel tips, ferry tours and more. You can also use these pages to find out more about saving money with a Brittany Ferries discount code. Don’t forget to check them regularly, as you can never be sure when free Brittany Ferries offers might be waiting for you! 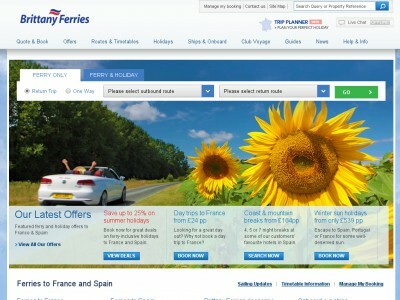 Buy now online at www.brittany-ferries.co.uk. It’s one thing to fly to your dream destination, but have you ever dreamed of sailing there? At brittany-ferries.co.uk, not only can you book an exotic ferry ride to your destination, but you can save when doing it by redeeming a Brittany Ferries discount code or some Brittany Ferries vouchers! Brittany Ferries discount codes make everyday a sale, and cost absolutely nothing to use. So if you’re on the lookout for a Brittany Ferries discount, you know what to do!